Our truck, our only transportation, was stolen overnight, right from our driveway. I was awake all night and didn't hear a thing, and the dogs never stirred, which is really odd. It's a very desirable truck, a 2006 dodge diesel 4x4 in black. It's probably already in pieces. It also had our cameras in it, some other electronics, a bunch of my tools, and most importantly, our car seat. I just checked our insurance, and it won't pay, because it turns out it had been cancelled a few months back because the credit card I had set to autopay had expired, but we didn't get the notification because they were still sending them to the old address. It's just been one damn thing after another the past few years. I thank all of you, still serving to defend our country, those of our friends and allies, and those who, wherever they serve, are fighting to preserve freedom, liberty, justice, and humanity. I thank all of my brothers and sisters who have served in the past; for the risks you have taken, and the sacrifices you have made. To the rest of the world, today is Remembrance Day, sometimes known as Armistice day, or poppy day; commemorating the moment that the first great war of the last century was ended; in the eleventh hour, of the eleventh day, of the eleventh month of the year of our lord nineteen hundred and eighteen. In fact, Europe has never recovered from this greatest of historical mistakes. It was the direct aftermath of world war one that lead to world war two; the combination of which largely created the postmodern European culture that is slowly being destroyed from without and within by self hatred, depression, defeatism, socialism, islamist theofascism, and reactionary nationalism. Flanders is a region of Belgium (along with Wallonia, and northern France), where the fighting in the great war was at it's worst . The worst battles of the war were at Ypres, the Marne, the Somme, and Verdun. At the Somme alone, the British lost 20,000 dead in one single day; and the allied forces (mostly British) lost 120,000 dead, and over 375,000 wounded total; with 100,000 dead and 350,000 wounded on the German side. The battle lasted from July 1st , til November 18th, 1916. Almost five solid months of the most brutal trench warfare ever seen; and nothing to show for it but blood, and mud. There was an amazing thing though... That blood, and that mud... it became magnificently fertile soil; and soon after the fighting ended, all over these horrific battlefields, poppies began to bloom. In the first great war, as had been tradition for most of western history, those killed in battle were buried in the fields where they fell. Their memorials were raised on or close by those battlefields; a tribute to those who fought and died, and a reminder to those who did not. In 1918, there, in Flanders, and Wallonia, and France; there lay an entire generation of men. 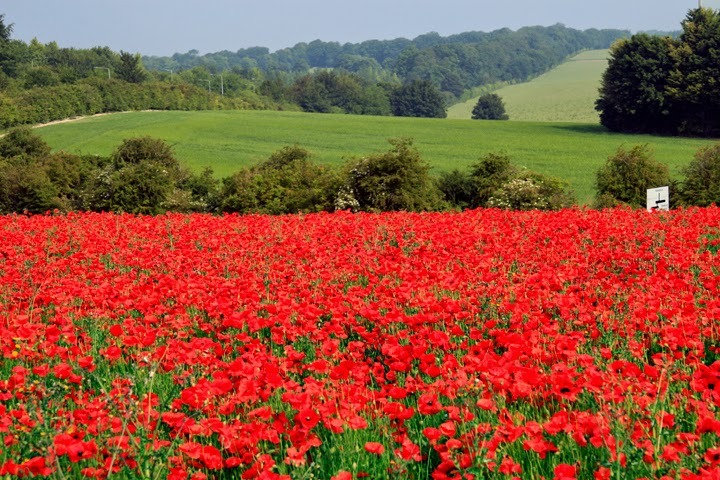 Millions upon millions of white crosses, millions upon millions of unmarked graves in farmers fields; surrounded by millions upon millions of poppies. A symbol of life, of blood, of the fight for liberty and freedom. The poppies among the dead were taken up; first by the French and the Belgians, then the Canadians and British and Americans. The Democrats have (and still do) very strongly supported big media and big communications, who are largely anti neutrality. It’s only now that net neutrality has obviously become a big issue among young liberals (who were largely unmotivated to turn out this midterm election), that they have pretended to support it. We've reached a point where the telecommunications monopolies that government created and support, are in fact deliberately applying anticompetitive, unfair (and in some cases already unlawful) restraint against their critics and competitors. This isn't just a prediction or libertarian idealism talking by the way. It’s been proved out in Korea, Japan… even in the UK. Everywhere that internet access competition has been allowed to flourish, everything has improved (conversely, in the U.S. where we have deliberately increased the power and scope of these monopolies, we have the worst internet access of any technologically advanced nation). Unfortunately, that isn't going to happen. Congratulations Republicans, you have a near record majority in the house, and what appears will be 54 seats in the senate (three races were still undecided at this writing. At least one is a near certain Republican victory, one appears likely so, and one is likely a democrat Victory). Some folks have been saying things like "Well, yeah, Obama's gonna veto everything... but hey at least we'll have a veto proof majority on some things, that a lot of Democrats support". Minority Democratic support for some "Republican issues" was allowed before, because it didn't matter. There was no consequence to it. I can almost guarantee you, there will not be one single override. No Democrat will be allowed by the leadership to be counted publicly supporting Republicans, against president Obama and the rest of the democratic party... at least not if an override would be successful. Now, it's an entirely different situation. A Democratic defection will be both a PR and a political disaster. It will hurt and weaken the Democrats even more than this election already has, and crash morale even more than it already has. Unless a Democrat will lose his seat if he doesn't vote to override a specific veto, it will NOT happen. In that case the leadership MIGHT let them vote for an override, maybe, if there is no chance of an override passing. If the situation is dire enough, a Dem congresscritter might actually defect without clearance... but that would have to be something pretty dire, because there is just about ZERO chance any Dem who did that would ever be forgiven if the override succeeded. They'd have to switch parties. Of course, if there's no chance of the override succeeding, most likely there won't even be an override vote (and if there really were such a chance, then Obama wouldn't veto, unless it were something the Dems absolutely could not stand for... in which case, again, there's no way it would get enough Dem support to be overridden). Even if there is however... Do you really think there will be 12 (presuming the total is 54 as it appears it will be) senators who will lose their seats if they don't override, on any specific issue? There are quite possibly 12 Democrats total who might lose their seats if they didn't override on issues that were very important to their state... but 12 on a single issue? In 2003, on the occasion of the loss of space shuttle Columbia, I wrote an essay titled “Outside Looking In”. As it happens, I think it’s one of the best things I’ve ever written, and possibly the most important. Yesterday, we lost Virgin Galactic’s spaceship two (and at least one of its two crew. The other is in critical condition). Within minutes, the cries to end all manned space travel had resurfaced in full force. People are already gnashing teeth and rending garments, and wailing, that space isn’t worth dying for. Given this, I thought it would be appropriate to post the original essay here. Nothing has changed substantially since I wrote it, except that even the desperately backward and hindering shuttle program has ended… and that now, it’s actually more than 42 years since we last set foot on the moon. I’m angry that the shuttle is gone, and there’s no replacement. I’m angry that we’re dependent on another country to lift our astronauts into space. I’m ANGRY that the shuttle was over 30 years old, and we poured resources and energy into the shuttle program for 40 years, with basically no real development of an alternate solution. Except that’s not PRECISELY true. There has been LOTS of development on alternate solutions, none of which have been allowed to succeed (and only two have even been allowed to proceed to where NASA was in 1960). We’ve spent tens of billions on alternate solutions, both public sector and private. Unfortunately, NASA has spent the entire time actively suppressing, delaying, or killing anything that would compete with or replace the shuttle; all as part of the bureaucratic funding fight. I know this first hand, having been involved in several of the SSTO projects in the 90s (I was free labor, as an engineering student and intern. I’m a pilot, an aviation and space nut, my primary degree is in Aerospace engineering, and I’ve been a member of the American Institute of Aeronautics and Astronautics since I was 18). Now, people, and I’m sure organizations and interest groups, are already trying to use this crash to attempt to ban private manned space travel. … which really means that most of them are trying to end all manned space travel period; since it’s not like the public sector has done much to advance the state of human space travel since 1972. It has been 45 years since we first landed on the moon, and 42 since Eugene Cernan (the last man to walk on the moon) stepped back into his landing module, and we left it. I’m angry, because we have willingly, even eagerly, become a frigate navy nation. it’s 2014… We should have spacelines. We should have private spacecraft available for purchase to anyone. We should be living on the moon, living on mars… we should be out in the stars. Instead, we’re still countering the nattering of cowards and fools, who only want to look inward. I’m angry… I’m more than angry, I’m disgusted. We have spent the last 30 years collectively contemplating our belly buttons. Let me explain what I mean by that (this is gonna take a while so get comfortable). Throughout most of history, humanity as a race has been outward looking. We strode out through the world around us to learn, to achieve, and to conquer. From the earliest days of humanity we have looked outside ourselves for meaning. First we had medicine men and shamans who looked to the spirits. Then we had priests who looked to the gods. Then we had philosophers who looked to the nature of the universe, and sought to find mans place within it. Finally there came that extraordinary breed of men to whom Isaac Newton belonged to. They called themselves the natural philosophers, we now call them scientists. Each of these groups of people sought to divine meaning, reason, purpose, from that which surrounded us. We were on the inside looking out in wonder, and eventually, with some small degree of understanding. This point of view was reflected in our societies as well. We explored, and built, and grew. We strove for bigger, more, faster, better. The expression of this has often been called “pioneer spirit”. It’s the challenge to go forth and do that which has not been done. It’s the desire to climb the mountain “because it’s there”. This spirit quickly had us wee humans spread across this globe, living in almost every corner, no matter how hostile it seemed to our rather thin and frail skins. This is the spirit that Americans inherited from the British, the Spanish, and the Portuguese; who it seems, have managed somehow to lose it over the past two hundred and fifty years. This is the spirit that pushed us from sea to sea, the spirit that flung us up into the sky, the spirit that exploded us out into space. This is the spirit best voiced by John F. Kennedy when he said “We do these things not because they are easy, but because they are hard”. Over the past 100 or so years this spirit became focused primarily on science and technology. We stopped exploring, not because we ran out of places to explore, but because we did not have the technology to explore them. So we built it, and we built it fast. It took only us 44 years to make the headlong rush from the Wright brothers, to sustained supersonic flight. It was only another ten years before we managed to stick something far enough up there that it wouldn’t come right back down again. Three and a half years later we finally opened up the door and left the home of our birth; when on April 12th 1961, Yuri Gagarin became the first man to see the earth, from the outside looking in. Gene Roddenberry wouldn’t make the line famous for another 16 years, but Yuri Alekseyevich truly had, boldly gone where no man has gone before. One of us had finally made it off the rock. Then, at 10:56 pm EDT , July 20, 1969 we managed the short hop to the next rock. Neil Armstrong and Buzz Aldrin, had made it to the moon. …we turned out the lights and went home. Unfortunately there has been no tomorrow. As I was saying, we have spent the last 30 years contemplating our belly buttons. After World War II most of the world stopped looking forward, and started looking inward. There were too many social problems. There was too much poverty and hunger and disease. There was far too much pain screaming out at us from the horrors of the preceding 10 years. The spirit of exploration that had pervaded humanity since it’s earliest days was completely gone from Europe by the 1960’s. It had never really existed in east Asia, where culture and philosophy had been directed inward for thousands of years. It had not existed in the middle east since the days before the ottoman empire. The only explorers left by the 60’s were America, and Russia, and Russia was only really doing it to compete with America. People all over the world started questioning the values that had formed previous generations’ assumptions. The generation born between the end of the depression, and just after the war, KNEW that there were more important things than exploration. They KNEW that this desire for exploration was just another form of conquest and exploitation and imperialism just like the ones that had brought about the worst conflict in human history. They KNEW that exploring space was waste of time and money that could be better spent on ending hunger, or disease, or racism. And so we began to turn inward. With books like “the catcher in the rye”, “On the Road”, “One Flew Over the Cuckoos nest”, we started looking more at ourselves, and our neighbors, and less at the outside world, and the outside universe. They KNEW that they weren’t going to spend another dime going to the moon ‘til we had fixed things down here on earth. In the broader culture things started changing even more. We encouraged people to take a good long look at themselves. To say I’m Ok You’re Ok.
To be fair, a hell of a lot of good came out of this. For the first time we started seriously exploring the WHY behind a lot of mental and emotional problems. We started leaving bad marriages behind, and we started trying to be happier. We started doing something about racism, sexism and pollution. …But as usual, we went too far. We started confusing confidence with arrogance. We decided that power was bad. We made aggression and competition synonymous with evil. We started subverting science to ideology, and we decided that ideology was after all, a science. In our most extreme moments, we decided that boys were bad and girls were good. That white was bad and black was good. That both old and new were bad, and only NOW, ME, and US, was good. Instead, we are spending all of our time looking sideways, up, down, in, and increasingly backward. Maybe this wouldn’t be too bad if we weren’t so bad at it. It would be a good thing, if we were able to do so without damaging ourselves, and without halting progress. …But so far, we aren’t. We haven’t been out of high orbit since 1972. It only took us 66 years to go from being earthbound, to setting foot on another planet. In the past 30 years we have have gone no farther, no faster, no higher. We have stopped going where no man has gone before. Charles Krauthammer wrote in the weekly standard that “we have put ourselves into a low earth orbit holding pattern”. Putting it a little more directly, we’re circling the parking lot looking for a space, instead of getting out of the damned shopping mall, and actually going some place and doing something. The most significant technologies of the last thirty years have been global telecommunications; exemplified in the internet, and biotechnology. Both of these are essentially focused inward. The internet has the potential to be the single greatest advance in mass communication since the printing press. It allows for true interactive communication on a global scale, but it is essentially inward facing. Because it exists to exchange information we already have. The internet spreads knowledge around better than anything we’ve ever come up with and that’s great. It’s the greatest enabler of science history has ever known because it allows the freer and easier exchange of ideas, but the net in and of itself does little to advance the state of human knowledge. The internet is not like the microscope or the telescope or the space craft. Completely new things are not discovered or created by the internet, though they have without doubt been enabled by it. BioTechnology is by very definition focused inward. At it’s deepest level BioTech is the study of what makes us what we are. It promises to unlock near limitless potential for our biological beings. It opens the door to the possibility of ending old age, disease, hunger, even death itself. It offers potential dangers equal to its potential wonders. BioTech is probably the second most important field of technology ever devised, but exploration is still by far the most important. As no nation can be great without looking beyond its borders, no race can be great without looking beyond its planet. Whether there are other races out there, or we are alone; if as a race we are ever to progress beyond our current state of semi civilized savagery, to progress beyond a planet full of petty squabbles between nations, that just might incidentally kill us all; we need to venture off this planet in the largest scale possible. We need to live on, not just visit other planets. This is a concrete lesson of history. We started out as individuals. With villages we had a larger purpose and organization, and the fighting between individuals lessened. For thousands of years villages, clans, and tribes killed each other until we formed city-states. Then the fighting between tribes lessened. We began to form principalities and petty kingdoms, and they repeated the pattern, lessening the conflicts between cities. Finally we formed nations, and eventually ended most organized conflict between smaller groups. But we created the nation about 10,000 years ago, and we haven’t really come very far since. Half of Europe was STILL in the city state or principality phase 250 years ago. Germany is now by far the largest and most important nation in Europe (no matter what France and England may say), but it only became a true nation in 1872. The United Nations is, at best, an ineffective organization with more politics than solutions. At worst, it is an organization used to spread the ugliest prejudices of humans, while decrying the actions needed to stop them, and masking it all under cynical self righteousness. It is clear that until we become an extraplanetary race, we will never achieve anything resembling a free society of all human beings. It is similarly clear that once we do become truly extraplanetary, such a society is, if not inevitable, at least more likely. Many would say that we need to solve our problems here on earth first. They believe that we can’t afford space exploration while people starve, and die of disease, and are denied basic human rights. They say that it costs too much, that it’s dangerous, that it has little benefit to the vast majority of humanity that has barely enough to eat. It will be a case of belly button contemplating on a racial scale.